With its fox-like face and a thick fuzzy ruff around its neck, the Schipperke has upright triangular ears. If born with a tail it is docked, a Schipperke is tailess. When viewed from the side, the Schipperkes are square shaped. Schipperkes range from 9 to 13 inches (22-33 cm.) in height. Schipperkes range from 7 to 18 pounds (3-8 kg.). 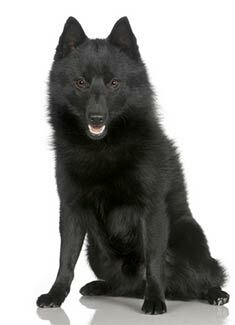 Schipperkes are solid black, chocolate, sable or cream. Schipperkes are clean and generally take care of their own grooming needs. This dog breed should be brushed regularly. Schipperkes will 'blow' their coats sometimes three times a year. This is where they shed their entire undercoat in 10 days, the result is an ugly dog for 2-3 months until the hair grows back. A Schipperke can be professionally groomed to ease the mess of the blow. Schipperkes love their families and will always be protective of them. This alert, curious and intelligent dog breed loves children and tends to bond very closely with their master. The Schipperke is a big dog trapped in a small dog's body; they are self-confident and will play with any dog of any size. Schipperkes love to howl and bark and make excellent watchdogs, standing their ground no matter what. Schipperkes make excellent boat dogs. Schipperkes should not be overfed; otherwise they are a healthy breed. A Schipperke can be expected to live about 15 or more years. Quick and tireless the Schipperke loves to run and play and will run around indoors. This breed should also be allowed to run free in parks and open spaces. Find Schipperke Puppies with our Free Breeder search!